The house lights rise in a crowded auditorium at the Metropolitan 14 — a South Austin movieplex fashioned of equal parts Las Vegas neon and Fisher-Price plastic — revealing the quiet entrance of a gnome in sagging pants and black-rimmed glasses. The audience, a blast of ball-cap and blue-jeans youth, tenders a standing ovation as the crumpled figure takes a seat under honeyed lights in front of the screen. Woody Allen fits a modern popcorn-plex like Ozzy Osbourne fits normal family life, but a pinwheel of tics and mannerisms — in attire, gesture, cough and stammer — betray the writer-actor-director. Like Elvis or Madonna or Bozo, it could be no one else, and the kids give it up for Woody. It’s Monday night and Allen’s new film, “Hollywood Ending,” a dollop of comic meringue, has just finished playing to an invite-only crowd of University of Texas students. Salted with glib movie-biz satire, the romantic-comedy has left the audience in a happy glow, nursing a collective laugh hangover. Woody Allen. In Texas. Imagine Franz Kafka snatched from 1920s Prague and plunked in the Old West. Allen was here as part of a publicity tour that is taking him to special screenings for college students in four cities. Right off the plane, Allen and his entourage — wife Soon-Yi Previn, sister and producer Letty Aronson, and others — were shuffled by studio handlers to Iron Works Barbecue for a taste of Texas. Allen by habit does not invite pleasure. It is a specter around which he circles with yearning but distrust. In the 33 films he has both written and directed, Allen demonstrates an artist and persona constitutionally incapable of finding satisfaction, comfort, enduring love and meaningful happiness. Which is partly what makes him such a powerful comedian, one of the best in our lifetime. He mines laughs from misery, finding bottomless gallows humor in the snarled crosscurrents of human desire and psychology in these modern times. In films like “Annie Hall,” “Manhattan,” “Crimes and Misdemeanors” and “Husbands and Wives,” the philosopher-auteur confronts the hardest questions life puts forth, and comes away bruised and baffled and hilariously human. Why are we here? Who knows, but we’re laughing. “Hollywood Ending” marks Allen’s third consecutive helium-pumped lark — a disposable, rapid-fire gag gun that risks resonating with viewers no further than the theater parking lot. The film, which stars Tea Leoni, Treat Williams and Allen in full neurotic fluster, follows “Small Time Crooks” and “The Curse of the Jade Scorpion” as uncharacteristically sudsy capers that seem to topple for lack of intellectual ballast. They are gangly, empty things, so weightless their staying power remains in question. Do these films herald a sunnier Woody?, a student asks the slight man in the chair. Allen, 66, spoke to me Monday at the Four Seasons Hotel. Austin American Statesman: Since 1992’s “Husbands and Wives” your films have taken a lighter turn, veering away from bigger issues, almost a throwback to your “early funny films” of the ’70s. 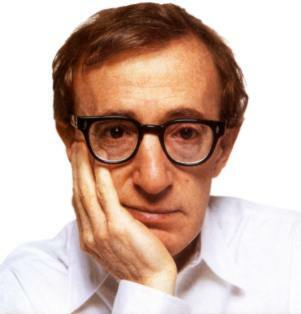 Woody Allen: You’re thinking of the last three movies that I’ve done, which have been out-and-out comedies. And that’s just a pure coincidence. I had some funny ideas in my drawer — I’ve accumulated about a half dozen — and I did a block of them at once. The one I’m starting to film on June 3, called “Anything Else,” is a more serious comedy. What about your new openness with the press and public — this sort of Woody glasnost, drawing your Iron Curtain? Suddenly you’re going to the Oscars and Cannes for the first time and you’re doing an unusual publicity tour. It’s so funny. It’s all coincidence. When I was with Sweetland Films (his former distributor) I did about seven pictures, and I did a certain amount of press. I did it for Harvey Weinstein too, when Miramax distributed a film. Did the tabloid controversy in the early ’90s have anything to do with your accessibility of late? Well, when that happened I had gone with Sweetland. Sweetland were friends of mine, and they asked if I could help them by doing some press because they couldn’t afford what a big film company can spend on press. The minute I went with Sweetland I started doing more press, as a friendly gesture to Sweetland. I wanted to be as cooperative as I could. And then when I went with DreamWorks they had these ideas for me, like college and music tours. Is Woody Allen lightening up, happily going to the Oscars for the first time? Oh, no, no. I wouldn’t have gone on the Oscars. I didn’t want to go. If it wasn’t for Sept. 11, I never would have gone. I didn’t go on to get an award, give an award or plug my picture. I went on because they said they wanted me to do something for New York City and introduce the filming-in-New York segment and tribute. Does DreamWorks grant you the full creative autonomy you’re used to? Sure, because DreamWorks doesn’t pay for (the films). They’re not financing me. It’s all independent financing. They just get a product. They don’t get anything to say about it. I turn it in, and it’s finished. Then they look at it. They’re very nice people, so whether they like it or not they say, “Oh this is great, we’re so happy.” They may not always feel that way, I don’t know. But they’re too decent to tell me the truth if they don’t. How have you felt about your work, say, in the past 10 years? What about “Manhattan” and “Annie Hall”? First of all, “Manhattan” is a famous story: I was so disappointed with “Manhattan” that I offered to make a free film for United Artists if they wouldn’t release it. “Annie Hall” I had no feelings about one way or the other. I made it and I was very surprised by the response that it got, you know, because there’s no correlation between my feelings about a film and the public’s feelings. You’ve openly striven for artistic greatness. Have you achieved it yet? No. It would require doing something that clearly is great. Looking back, do you think your films have passed a test of time that might push them closer to greatness? I never look at them. You know, I made my first one, “Take the Money and Run,” in 1968, and I’ve never seen it since, nor any of the others. Would it kill you if you saw them? It would kill me, yeah. (Laughs.) That’s exactly right. I would sit there and want to open my veins, you know. Will you ever make the film, the piece of art, you’ve always wanted to make? I don’t think it’s going to happen, and it’s depressed me, but I don’t think it’s ever going to happen. I can make some films that are better than others, some films that are perfectly decent to show to an intelligent audience and some that are not so decent. But it’s not in me to ever make a film on that level. I don’t think I’m ever going to make “Grand Illusion” or “Bicycle Thief” or “The Seventh Seal.” And it won’t be for lack of trying. But it’s probably that very trying that militates against doing it. It’s probably not the kind of thing you can try and do head-on. You work incredibly fast. Maybe if you slowed down? I don’t think so, because I don’t work as fast as you think. The speed comes in from being backed, from not having any financial problem. When I write a film, I take as much time as I need to write it. If it takes two weeks or six months that’s how I do it. But when I’m finished with it, I pull it out of the typewriter, hand it to my production manager and (snaps his fingers) the next day we’re rolling. We’re budgeting, we’re in pre-production, we’re calling casting. Another writer takes it out of the typewriter, and he’s got to sell it to the studio. But there’s also the idea of draft after draft, the whole torturous process of writing. And I go through all of that. If I had another six months or another year it wouldn’t be any better. I’m where I am in the script, I think it’s great when I finish it, and then it doesn’t come out great, you know. Some other poor guy finishes his script and has got to have lunch with Warren Beatty 15 times and hope to get the money and a commitment, and he gets his film on two years later. I get mine on 14 weeks later. Your themes have been a constant: love, death, failed romance, existential crises. Has this changed at all? I think it’s really the universal verities that hold throughout that interest you. It isn’t the evanescence of politics or social issues. All that stuff comes and goes; it’s meaningless. I would be doing the same themes — it sounds bigger than it is — that Tolstoy was writing about, or Stendhal. Those are the things that are so difficult to come to terms with. Someone once asked you, “What do you have faith in?” and your answer was, “The power of distraction,” as in work, romance, the daily hustle. It’s the best you can do. I’ve said this before, but I really do think it’s true: Art is the intellectual’s Catholicism. It’s a belief in the afterlife, that you’re going to be saved by your works in posterity. But it doesn’t work. It doesn’t mean anything. Really? You work so much, you’re clearly finding some kind of purpose. That’s a distraction. It distracts you. It’s like fingerpainting in a lunatic asylum. You know, busy fingers are happy fingers. You know, or basket weaving. . . . We all need something. Otherwise we tend to face and think about and confront unresolvable issues that are implicitly terrifying. You have come no closer to finding answers or comfort through your art? No. You just suddenly get a big dose of reality. Life is a constant battle to keep that reality from encroaching upon your thinking. Everyone’s built with certain denial mechanisms. You need a good one for survival. If you don’t, then reality starts to crowd in and reality is such an unpleasant, such a bad place, to have to hang out in. Are you still uncomfortable with the success of some of your work? It’s something you have to watch out for. When you start to succeed too much you gotta be careful. If you’re working seriously you should always be a step ahead of your audience and challenging them and experimenting for yourself and not repeating yourself and getting into that formula that they’re only too happy with. You know, they would have loved “Annie Hall 2.” But I don’t want to do that. I prefer to fail a lot of times. It’s healthier for you. There are people I know in theater, books and film who succeed and succeed and succeed and they’ll never be great.